: Good work. 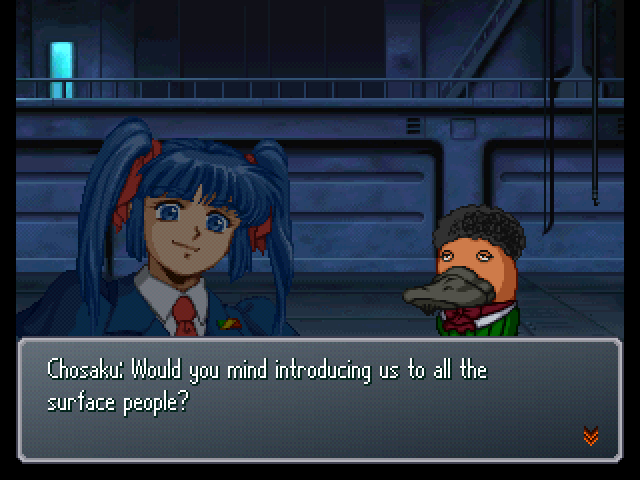 Dr. Anzai, have you figured anything out about that underground facility? : Couldn't it be something else? : Yeah! Like a base for the Mycenae that just now showed up. : It could be a Nubian structure. : I see, there is that line of thinking. : No... We can't drop the possibility that it's the Earth Cradle. : (.........) To be honest... My best friend participated in Project Ark. : Eh? Is that true, Doctor!? 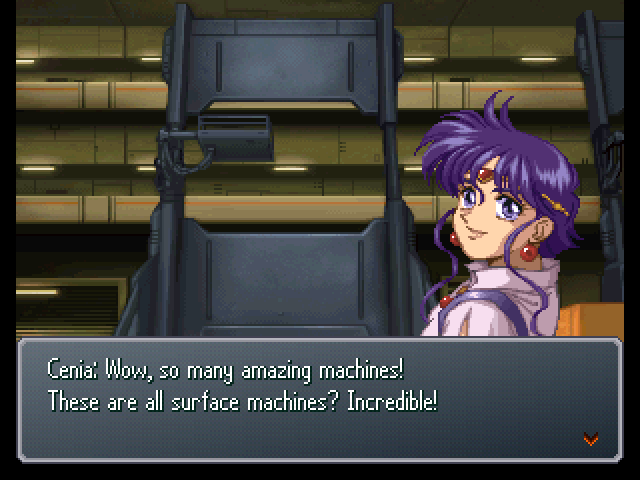 : I see, so that's why you went to all the trouble of coming to the Argama in person. : Sophia...? That's the name of your best friend? : Yes, sir. 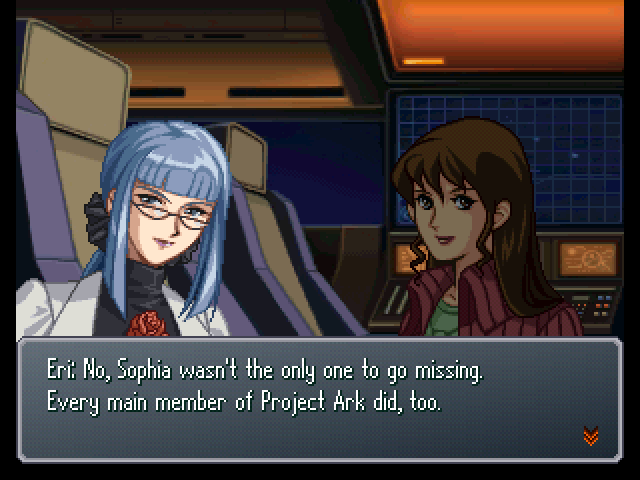 Sophia Nate... She's a key participant in Project Ark. : But a tiny group of people couldn't build a whole artificial hibernation facility underground. : For exactly what purpose? 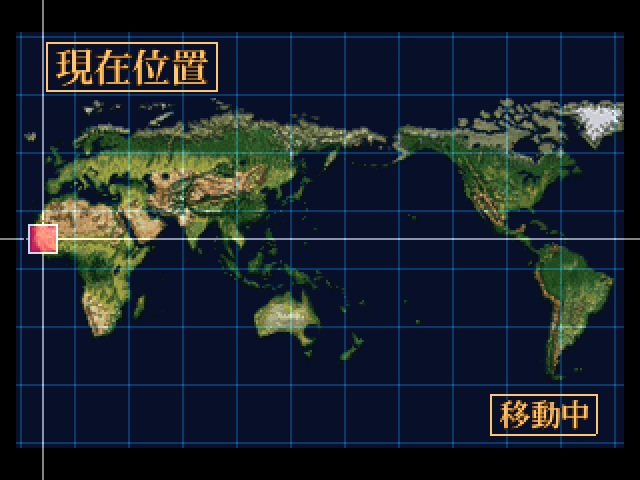 : Maybe it's connected to the Great Atum Project that Khamen guy was talking about...? : Who on Earth is that man...? :: He is quite an enigma. Even my intelligence network has yet to get a solid profile on him. 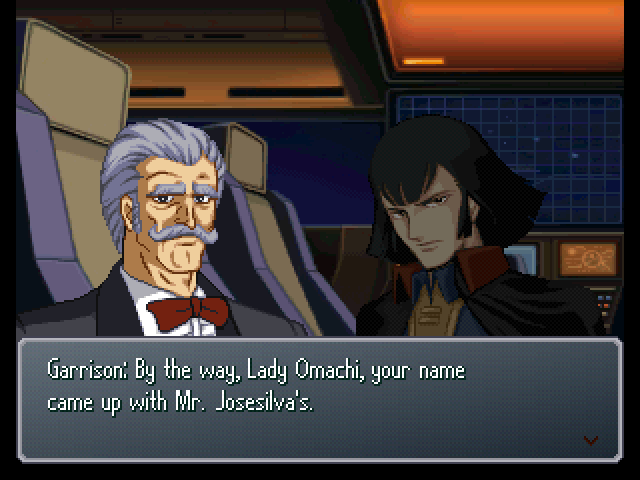 We have fresh information claiming that he had a secret meeting with Mr. Josesilva Valencia of the Federation Government Space Development Bureau. : A secret meeting... What for? :: Our information does not go quite that in-depth, I am afraid... Mr. Josesilva has been charged with the post-war redevelopment of the inner planets of the solar system. : Underground, and planets in the solar system...? I must be missing something here. : They must have some sort of connection to the Great Atum Project. :: Is there some relation you might have? : At any rate, we'll head for Dakar. 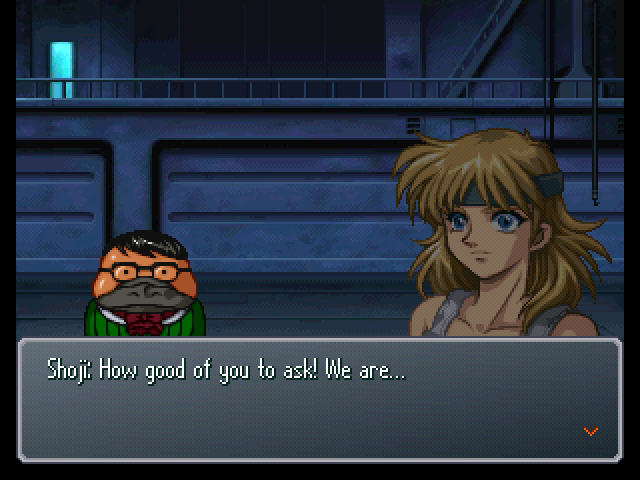 Dr. Anzai, would you mind saving investigation of the underground facility until after that? : Hm? Is that Masaki over there? And that girl with him, isn't that...? : ...Don't tell me this is the reason you came all the way to the surface? : And isn't it convenient that it was the perfect chance to test out the upgraded Nors? : Well, sure, but... I came to the surface for a perfectly valid reason. : A perfectly valid reason...? : Still, this hangar is really something else! : No kidding. She reminds me of someone. : She's apparently the princess of a kingdom called Lan Gran, in La Gias. : Lan Gran...? Oh, the subterranean kingdom Masaki was at. : Huh... Boy, do we ever get a lot of those types. : Princess or not, since I'm not in line for the throne, feel free to just call me Cenia. Wow, surface machines have such well-made transformation and combination mechanisms! : It's still in humanoid form... You can tell that just by looking? : It's the Z Gundam. I did the basic design work for it. : Really? Hey, if it's alright, would you mind showing me the blueprints? 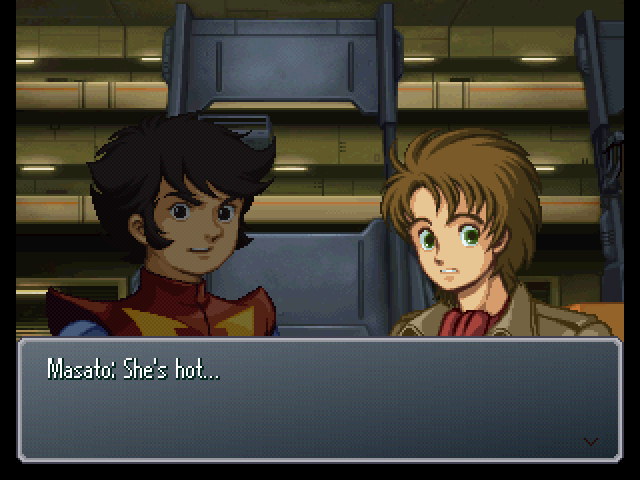 : ...Boy, if Ryusei's a fan, then she's a fanatic, huh. : Well, Cenia is the chief inspection officer of the intelligence bureau and she does Elemental designs and computer designs herself, you know. 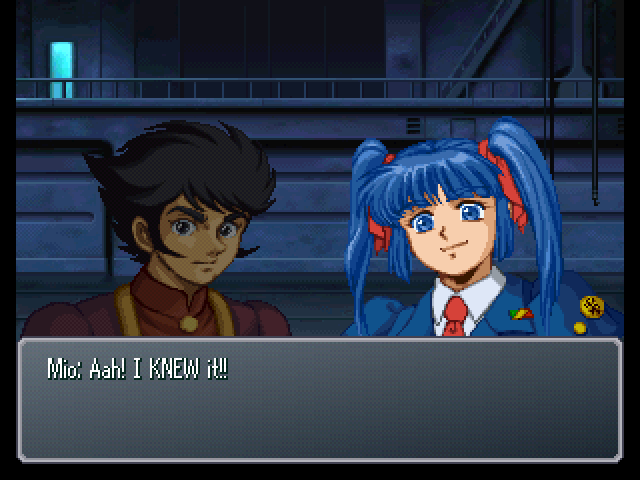 : Oh, come on, Kamille... What's with you, getting all red like that! After that, something rather strange happened. : I knew it, it is you, Brother! : Brother, I've missed you so...! : Oh, Brother, you never change. You always pick on me like that! : I'm Rosamy. Are you my brother's girlfriend? : E-er, is that so... Um, thank you. ...Wait, no! 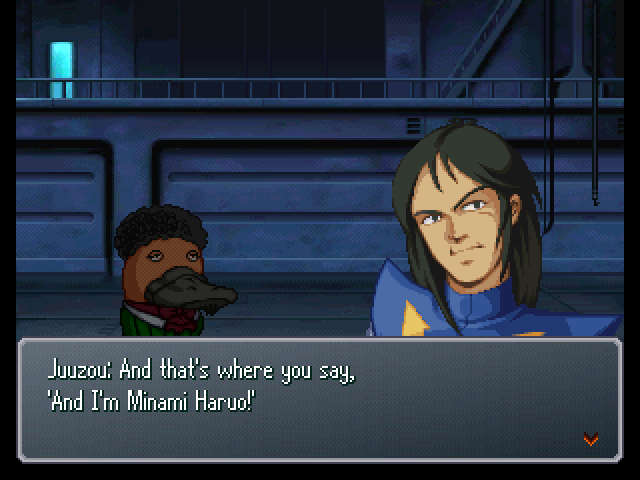 This person is Kamille! He's not your brother! : What do you mean? He is my brother! 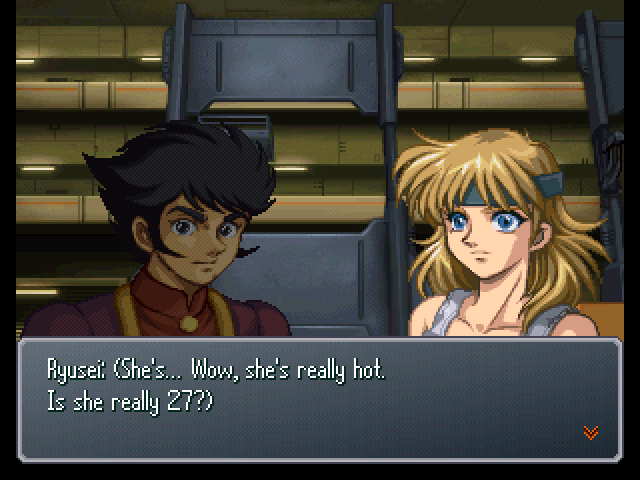 : Is it true, Kamille? : What are you saying? I've been friends with you since childhood! : I'm not lying! See? 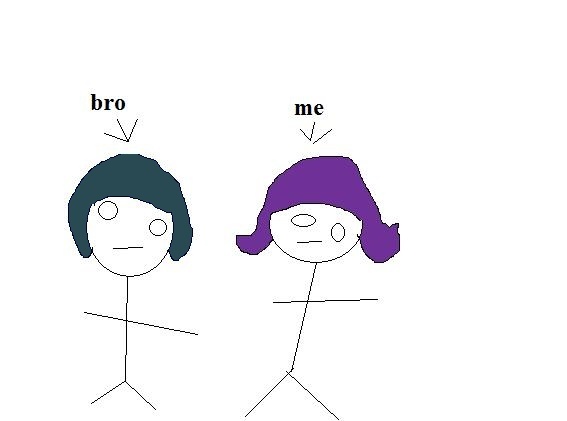 Here's a picture of us from when I was younger. 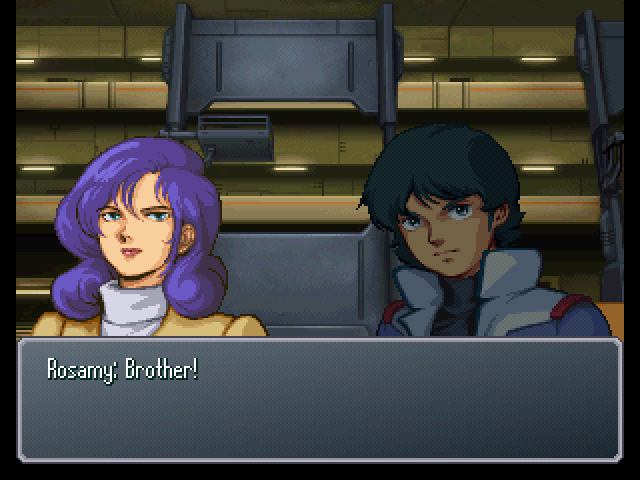 : Wow, this really is Kamille, isn't it...? : Ooh! That's my brother's Z Gundam, isn't it? : Oh yes, Masaki... I'd like to take a look at Cybuster's feedback circuit. : ...Did Wendy come here too? : Yes. She said she'd do Cybuster's tuneups up until the last possible second... Didn't you hear? : Ah, that's right. 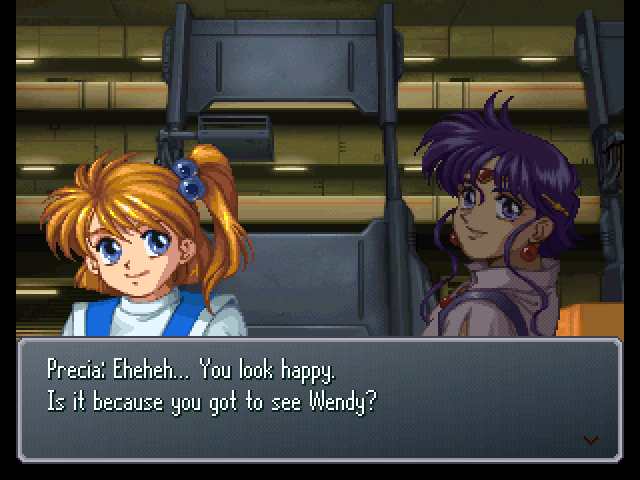 Wendy was hospitalized when you gave Cybuster to us, that's why. : Is Wendy better now? 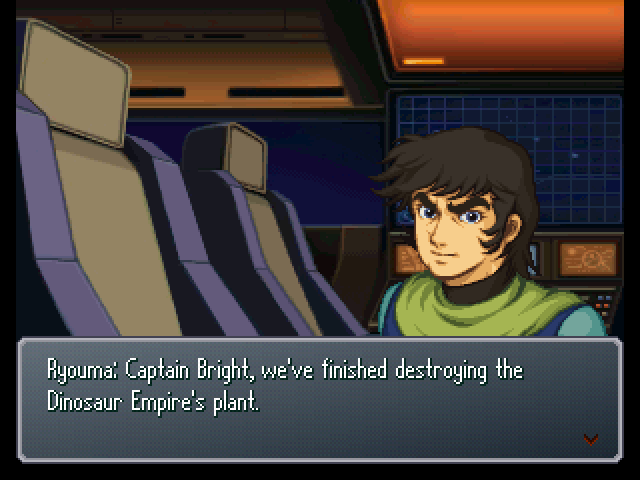 : Well, let's head over to Cybuster. Wendy's waiting, too. : You're bringing that up again? : Pleased to meet you. I'm Tyutti Norback. : Yeah, I heard about you from Yang Long. 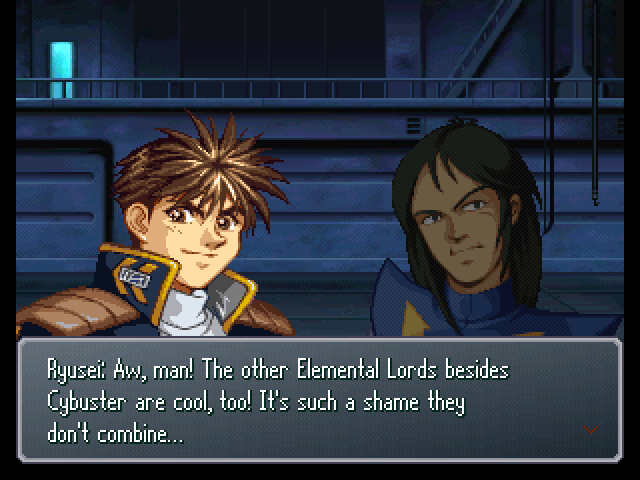 You pilot the Elemental Lord Goddess, right? : Really!? Please, let me get a picture with it...! 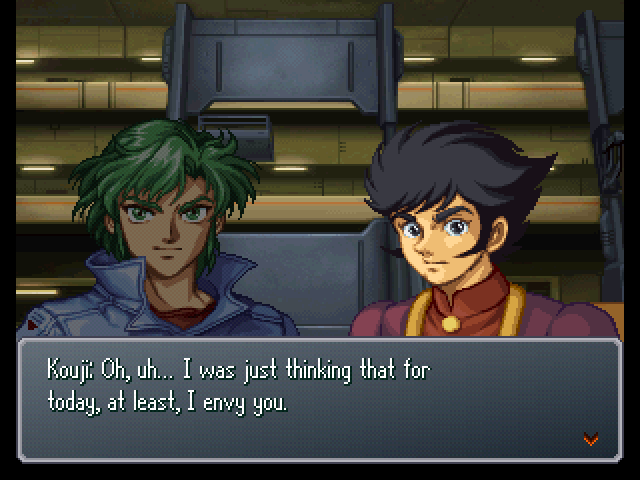 : Hehe... Might you be Ryusei? : Eh...? You know who I am? : You're not being complimented there. : You all have taken a great deal of care of Masaki... Allow me to give you my thanks. : I've got no idea what they're talkin' about. : You're awful! You tossed me aside! Where did you go!? : Ryusei, what does she mean, you tossed her aside...? : H-hey! I'm innocent here! You've got the wrong guy, I've got nothin' to do with this! : Oh? You two have met? : Yup. I had a lovers' spat with this guy when I was on the surface. : Eheheh... I was just kidding. He saved me when mechabeasts attacked Shinjuku. : So I wanted to offer my gratitude. Seriously, thanks. : Oh yeah! I totally forgot, sorry. : Wh-what are you guys...? : !! HEY! Ya stole my opening! : Wow, that timing... I barely left any room for witty retorts. : You're no amateur, are you? : Heh... Never underestimate someone born and raised in Kansai. : What are they talking about, exactly...? : Are those guys your familiars...? : Yup! We're all pleased to meet you! : Oh, just so you know, they're platypi. : (.........) Say, Tyutti. Is someone named Wendy here? : You know of her? : Yeah... I heard about her from Kuro and Shiro. : Well, I'd kinda like to see my rival in love, y'know... Say, how old is she? Is it true that she's really good-looking? : As far as age goes hers is 27, if I recall correctly. As for whether or not she looks good... Well, if she didn't count as good-looking, Around 80% of the Earth's good-looking women would no longer count as such, either. : ...So, basically, she's ultra-gorgeous? But, that age... Okay, I'll compete with my youth! : Who's this Wendy person? : She's the alchemist that designed Cybuster and the Galguard. 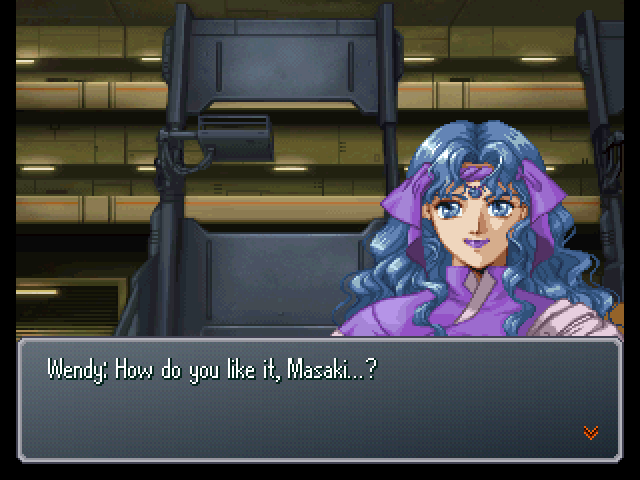 Oh, and she's totally got a crush on Masaki. : Wow, and I thought he couldn't deal with women. : Hold on, there! What do you mean by that!? : I was just gonna head over to Cybuster, so wanna come and see for yourself? : It's got a better feel than it had before. You're great, Wendy, thanks! : Sure, you've got my gratitude, too. : What do you mean, 'too'? : N-no way, it's got nothin' to do with that. : Ah, Mio and the others are here! : Yoo-hoo! 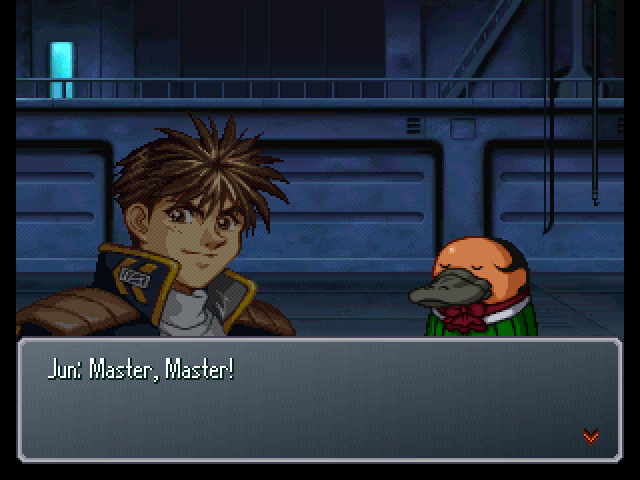 How's Cybuster, Masaki? : What's with all you guys, coming over here together? : I wanted to meet the person with a crush on Masaki. : The person with a crush...? Oh, my. 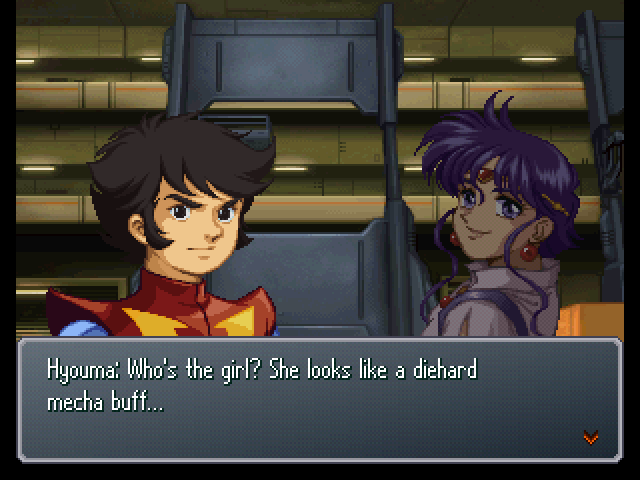 uh... That's not Ryusei, game. : Oh, and who might you be? 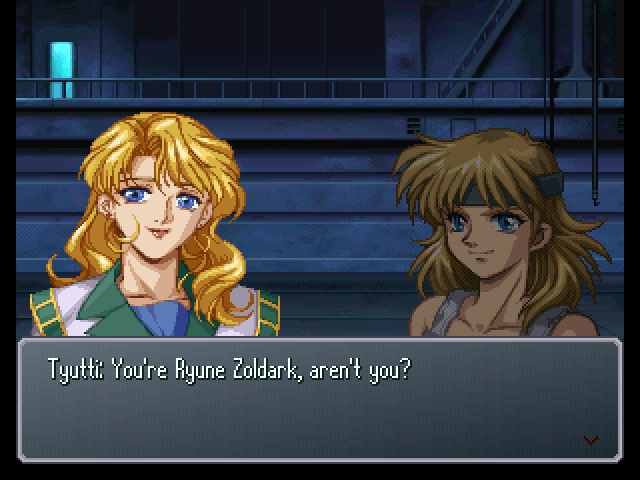 : I'm Ryune Zoldark! Masaki's girlfriend! : Or so you'd like to think, right? : My, Masaki, what a wonderful girlfriend you have. Such a cute lady! : W-we're not like that, okay? : Wh-what do YOU call what we are, then!? : *giggle* You get along so well. I'm jealous. : By the way, Wendy... How's your health? Are you all better now? : I'm still on a medical prescription, but... Don't worry, I'll stay with you until Cybuster's testing is all done. : Eh!? B-but... Are you sure about that? : Yes. If I can be of any assistance, it would be my pleasure. 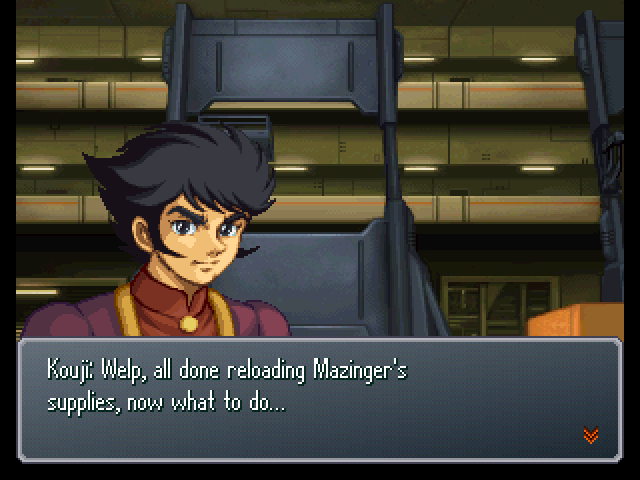 : What's with that expression, Kouji? : Being surrounded by so many beautiful women... I really envy you, I swear. : Er... is that right? : Hold on! 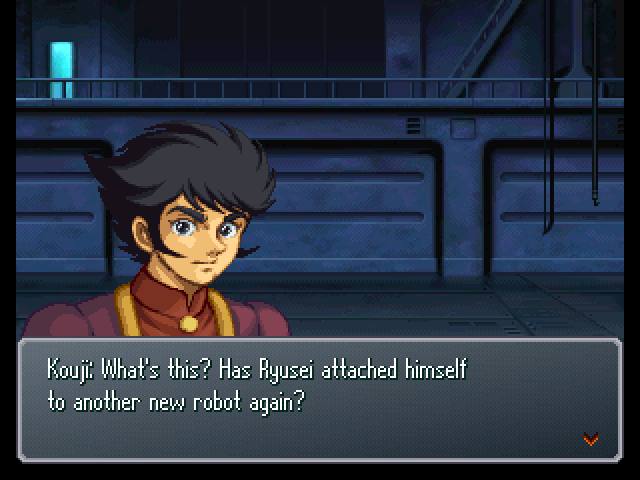 Kouji, what do you mean by that!? I'm not enough for you!? : What is it, Wendy? : I envy you as well, being blessed with so many friends, even on the surface. : And I've seen a side of you I haven't seen before. It makes me a bit jealous. : ...Er, I'm sorry. What am I saying...?